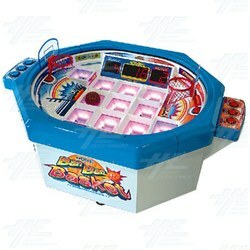 Ban Ban Basket is a table Basketball arcade game. PUSH your shoot button to launch the ball and get a GOAL.It is easy to play; players start the game by push the shoot button and get a goal, and then aim the hoop and try to throw basketballs into the ball jam to score points within the limit time. PUSH your shoot button to launch the ball and get a GOAL.It is easy to play; players start the game by push the shoot button and get a goal, and then aim the hoop and try to throw basketballs into the ball jam to score points within the limit time.